This distinctive shadow box includes three (3) separate compartments. 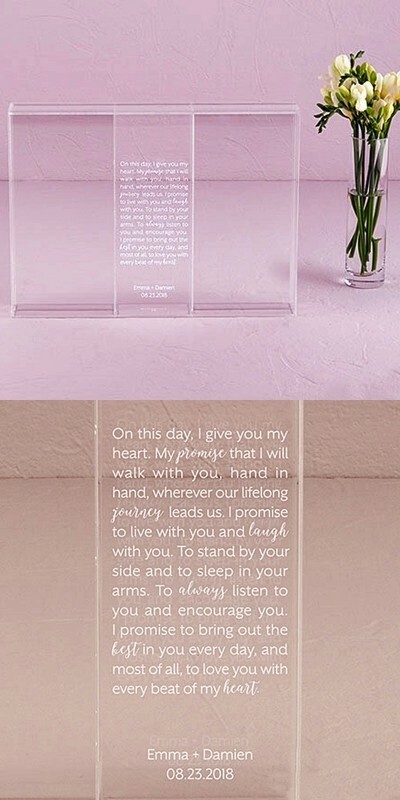 The center is intended for use as a vessel for a unity sand ceremony and is inscribed with a lovely "A Promise Made …" paragraph and your two lines of custom text below. The two side compartments will accommodate photos or printed messages (10" x 5"). Simply place between the two layers of acrylic provided and slide into position. Alternatively you may fill these compartments with your guests' well wishes, creating a cherished memento of your special day. Personalization is available only in the fonts shown. Enter up to Anchor (with Baby on Board) characters. "The wedding favor arrived today and I am thrilled with them. Thank you for your fast service and beautiful personalization." Werner McI.